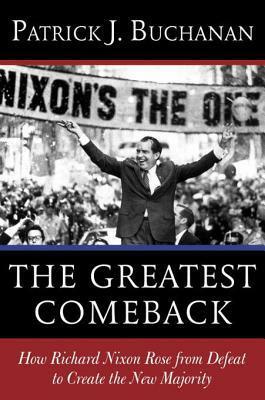 This is a fabulous book about not only the rise of Nixon from the political death to being elected to the Presidency, but also a look at the sixties and the goings on during those years. Still there are names that are in the news today, Romney, not Milt, but his father, Rockefeller, who might have gotten an nomination but during the convention after Nixon gave a speech bringing all the Republicans together and stop fighting, Nelson Rockefeller got up and did as he always di and attacked his own party and the ones who make the decisions. After this convention Nixon was back. Mr. Buchanan, takes you back through his defeat to Kennedy, and how people listening to that debate on the radio thought Nixon won, but if you watched it on TV Kennedy did. Yes the times were changing. By 65 when Johnson was elected President the Democrats held 295 seats in the House and 68 in the Senate. Since Ike had first taken office the Republicans controlled both Houses and now their strength had been cut to less than one-half of the Democratic Party. Mr. Buchanan, started working for Nixon in 65 and would continue to work with or for him until the day he resigned from office, so as you can see you are actually being told a story by someone who was actually their and at the back of the book there are copies of memos as well which I found to be fascinating. Now not everyone likes Nixon, I on the other hand grew up in a home that talked politics and Nixon was not a bad guy, all politicians are humans so they have good and bad that is what you get when they are elected. Back to the book. In 65 and leading up to the election of 66 which were all midterm elections Nixon was traveling to 35 states visiting 80 congressional districts, after the election the republicans picked up 47 seats in the house 3 in the Senate, 8 new governorships, and for states GOP 540. This was after losing seats from 58,60,62,64. It changed and people were crediting Nixon this all would come back to help him in 68, because people remember what he did for them in 66 and how he brought the party back. He then takes you through what went on to not only get the nomination but to win in 68 and again in 72. I people still think of water gate, but Nixon did do good he created the Environmental Protection Agency that everyone seems to love, the occupational Safety and Health Administration, the National Cancer Institute, I am glad for that one. Plus some others. Theses book would be a good read to get a feel for the 60’s and is a good political story of someone coming back for a third time. Well written and a good book. I got this book from net galley. 5 Stars.